This week, we used multiple servos and craft materials to make iterative pom-pom robots. It was refreshing to work on something that could be very quickly evaluated, scrapped, and redone. My initial design is shown below. 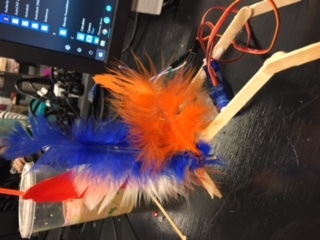 The two servos are connected with duct tape at the dotted line, and each popsicle stick is hot glued to straight servo horns. Each popsicle stick has been broken in half so that the bot will have a lower center of gravity and hopefully maintain its balance more easily. 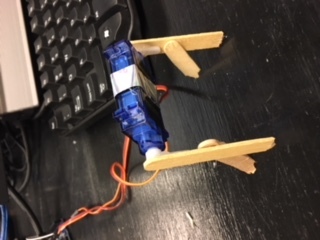 The bot will start in the “unfolded” position, and then both popsicle stick legs will press down at once, lifting it off the table. My bot’s movement was not inspired by a particular animal; for the first iteration, I just wanted to see how hard the servos could press off the ground. This prototype had a strong tendency to fall on its back and wave its legs in the air helplessly, so I tried adding some extra stability in version 1.5 below. This was not much more successful, probably because the weight was still unevenly distributed. 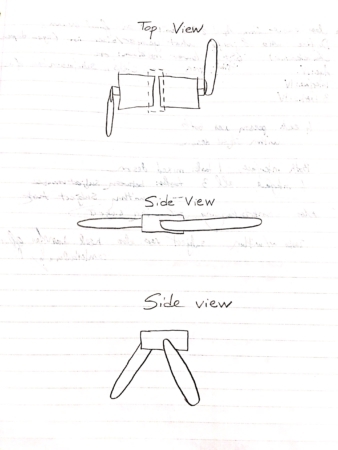 These iterations convinced me that I would need a robot that could stand stably before it tried to walk. Also, I wasn’t getting the results I wanted with code that tried to swing the servos back and forth by a full ~130 degrees, so I decided to narrow the range of the servo movement. I didn’t think the materials needed to be changed, since the wood was providing enough support, it just wasn’t placed correctly. Just for experimentation, I programmed each servo to randomly pick a value within 10 degrees of its rest position, and this ended up working! One leg of the robot was slightly longer than the other, and I think the fact that it was at a slight angle allowed it to travel (or rather, jitter) sideways. This was unintentional, but surprisingly effective, and if I were to do another iteration, I would make this unevenness intentional. It’s not the fastest or most elegant bot, but it moves very reliably to the left in a fairly straight line! I added some feather decoration just for fun. The resulting bot is more stable and more reliable than my first two concepts. I enjoyed working on a project that was quick enough for me to let go of my original design and truly focus on improving each iteration, without worrying about the time sunk into an early iteration.